Filled with the joy, wisdom, and hope of the Psalms, this 180-day devotional will help guide you along the path God has set for His children. Your life abounds with decisions. Some are simple, others complicated. Some are meaningful, others mundane. And some determine the very direction and legacy of your life. In the midst of all this, God intends that your life be filled with singing, not with fear, doubt, and confusion. 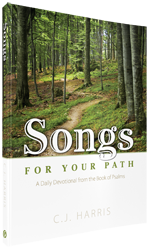 Songs for Your Path guides you on a 180-day journey through the Book of Psalms. You will see the stark contrast between God’s way—the path of righteousness—and the way of the wicked. Through it all your eyes will be pointed again and again to the God of your path and the glory of His majesty.